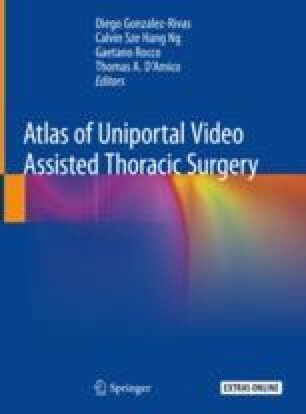 Video-assisted thoracoscopic surgery is the surgical treatment of choice for spontaneous pneumothorax. Most recently, this technique has been made even less invasive by the use of the single-port technique. Uniportal VATS treatment of spontaneous pneumothorax has been shown to be superior to traditional VATS in terms of pain and long-term paraesthesia, while ensuring the same efficacy in terms of prevention of recurrences. We describe herein the technique of uniportal VATS bullectomy and pleurodesis, summarizing the principle steps of the procedures and the evidence from the literature. The online version of this chapter ( https://doi.org/10.1007/978-981-13-2604-2_12) contains supplementary material, which is available to authorized users.